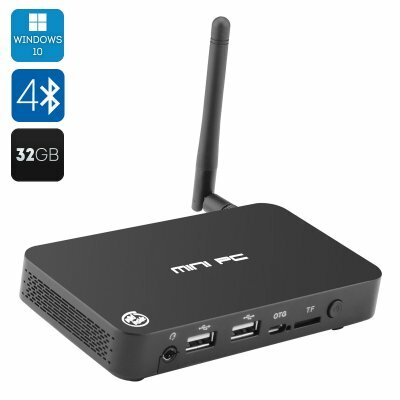 Successfully Added Windows 10 Mini PC 'I5'- Complete Windows 10, 4K (2880x2160), 1.33 GHz Quad Core CPU, Bluetooth 4.0, OTG to your Shopping Cart. Need to bring the power of Windows 10 to your home or office in a small, affordable, but capable package? The I5 Windows 10 Mini PC is exactly what you need! Windows 10 is the latest operating system by Microsoft. It brings the best of its previous iterations – Windows 7 and Windows 8.1 – into a neat and effective package. Now you can get the full Windows 10 experience for yourself in a small, affordable, and highly capable mini PC. The best part is that the I5 offers full support for 4K (2880x2160) resolution – meaning you'll be able to view 4k videos and images using this tiny package! The 1.33 GHz Intel Z3735F Quad-Core CPU handles the processing power, and is supported by 2 gigabytes of RAM along with a capable 7th-generation Intel HG Graphics GPU. The I5 also comes with 32 gigabytes of internal storage capacity, which can be expanded using external memory drives. Want a more compact package? Simply slot in a storage device card up to 64 gigabytes and you'll be good to go! The I5 Windows 10 mini PC is also capable of connecting to multiple accessories and peripherals at any given time. Bluetooth 4.0 ensures that you'll be able to hook up wireless gadgets like mice or keyboards. It also comes with a VGA and HDMI port, which allows you to use the I5 mini PC with a wide range of screens. A second-hand monitor or a full 4K TV – the I5's has the ports to work with them all! Then there is OTG or On-The-Go support, which ensures that the I5 is able to work with a wider variety of gadgets. OTG ensures that it will be able to send and receive information at the same time. This lets you hook the I5 mini PC up to other devies such as portable computers, tablets, or smartphones and access their data! All these features come together to form one of the most capable and budget-friendly 4k Windows 10 mini PC on the market! The I5 Windows 10 Mini PCcomes with a 12-month warranty, brought to you by the leader in electronic devices as well as wholesale Windows 10 mini PCs.. The Windows OS version on this device cannot be upgraded or flashed and any attempts to modify the default OS will void the warranty. As a wholesaler, we provide no software support, advice, or training regarding the Android operating system and software.